Hydropower › Ossberger Hydroturbines › Why choose Ossberger crossflow turbine? Ossberger would be pleased to show you their turbine test rig facility should you visit theirworks. You would then get an idea of our ongoing commitment to research and development of the original OSSBERGER Turbine. As soon as any design improvements are identified and well tested, they are referred on for our manufacture. The machine is particularly outstanding compared with other types of turbines for operating and regulating characteristics, as well as efficiency curve and level. The subdivided guide vanes provide a flat efficiency curve, they need to direct the water for a jerk-free entry into the runner. As the manufacture of cast guide vanes would demand too large tolerances, we only use calibrated profiled guide vanes. Both guide vanes can be set up independently, they can easily be dismounted towards the radial direction without special tools, the corresponding forces are absorbed by maintenance free friction bearings brand Permaglide with shaft protecting sleeves. Only calibrated guide vanes allow for a hydraulically perfect flow; you can look forward to operation without cavitation while maintaining high efficiencies. are fixed in the turbine casing by a locating lug. This permits dismounting the runner radially without removing the bearing casings from the runner shaft. A simple re-adjustable gland packing arrangement with hemp tallow cord seals the shaft. The hemp tallow cord does not need to be lubricated. partial vacuum is formed; for the exterior atmospheric pressure the suction column rises. A simple venting valve which is free of own friction controls the vacuum in the turbine casing to optimally utilise the energy potential. Utilisation of the whole head which is available from the upstream to the downstream level. solid by stiffening it at the same time in such a way that no vibrations are experienced. The blades consisting of bright-drawn profiled steel mean an ideal solution regarding solidity and water guidance. By utilising the bright-drawn and exact blade profiles an ideal balance condition is achieved automatically, only slight corrections are required on the balancing machine. The blades linear geometry does not produce any axial thrust, thus there is no need for pressure bearings. Another advantage of the flow guidance is that leaves, grass or snow, are pressed between the blades when the water enters the runner, then discharged again after a half turn by the leaving water, backed-up by the centrifugal force. Thus the self-cleaning runner is never obstructed. A high availability is decisive for the viability of your investment. A stable base frame is provided between turbine and foundation, permitting a rapid and sure installation. For automatic operation of the unit and the regulation of the turbine in accordance with water levels an electro-hydraulic turbine controller can be supplied. It is composed of a hydraulic unit and a control switchboard. Emergency stop in case of mains failure or any other reason, the generator switch release is made without any off-site energy through storage weights. The continuous water level registration is by a depth gauge and the regulation which is continuous, allows for an almost constant upstream water level and thus an optimal utilisation of the existing flow. The computer capacity of the specially adapted regulator element has been over-designed and allows for an long servicing interval as well as clear observance for the display, and all this operator-controlled, directly at the device. No special programming knowledge nor equipment is necessary. Our design concept does not comprise any aspects that need to be concreted in advance. On ordering your system you will be provided, along with the plan of installation, a plan of foundations which will enable you to prepare the site for a quick and trouble-free erection. The turbine and the base frame are mounted on the carriers laid in the primary concrete which is situated above the draft tube pit. Straightforward locating for gearbox and generator. The installation is made by means of foundation blocks. Each plant is completely assembled prior to its dispatch and tested at the manufacturer’s works. Thus it is ready for operation at site as soon as the erection work has been finished. The equipment is delivered as pre mounted units. Thus erection is limited to the exact alignment of the elastic couplings. Simplified civil construction as only plain surfaces need to be created. A part-load operation with Francis turbines may result in vibrations. The hermetically closing guide vanes will be sufficient for a shutdown of the plant, i.e. one may do without any sluice gate in front of the turbine or the guide vane in front of the turbine is sufficient for manual actuation. To make sure a reliable emergency shutdown storage weights have been foreseen. No DC current feeding is required for an automatic plant operation. There is no stillstand, neither caused by an obstructed runner (for the self-cleaning effect of the Ossberger runner) nor by small flow rates. Creeping ageing, e.g. due to material abrasion at the runner, as it is customary with reaction turbines, is unknown with OSSBERGER turbines. Thus the efficiencies of the OSSBERGER Turbines will still be the same even after decades of permanent operation. With the Ossberger system there is no cavitation risk at all. As there are no thrust bearings a simple lubrication system will be sufficient. The civil works required are utmost simple. In the turbine house an even floor with a rectangular opening above the discharge canal will be sufficient. The whole machine unit is lodged in a dry room clearly and with low space requirements and is well accessible from all sides. Routine maintenance can be made during operation. Maintenance requirements are negligibly small. 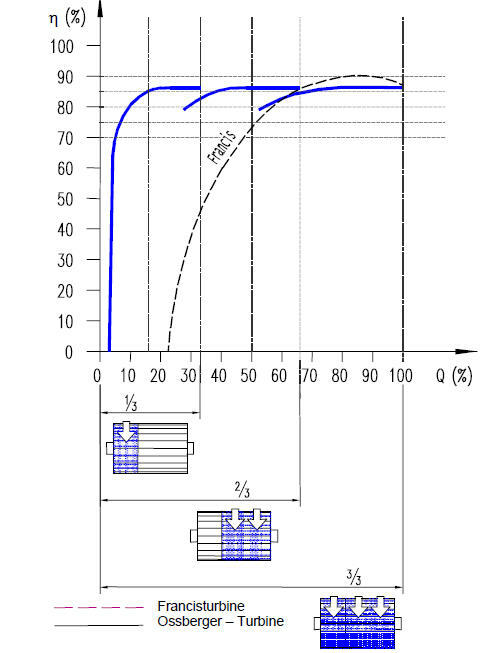 The incoming flow can be regulated over a wide range on a permanent efficiency level. This will allow for the selection of a bigger design flow than with Francis Turbines, with an essentially higher annual production. Proverbial simplicity (two or three movable elements only). Standardised self-aligning roller bearings are used as main bearings, situated outside the water flow. Thus no lubricants are admitted to the water, moreover an exchange against standardised parts is permitted.